﻿These stunning VIA DELLA SPIGA tassel earrings by ISABELLE LELOUP JEWELRY are handmade in Belgium in ruthenium-plated Brass, and embellished with delicate silk/rayonne tassels that gently sway with every step. Perfect with an elegant chignon or simply an updo. - Stud and butterfly fastening for pierced ears. - Clips available on request. 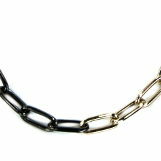 - All our jewelry is nickel-free and hypoallergenic. Comes in its ISABELLE LELOUP JEWELRY box.